There’s nothing quite like receiving a handmade gift, and your family and friends will love being on the receiving end of these handmade designs. Designer Mags Kandis inspires with this delightful collection of beautiful and colorful little projects for you to knit, crochet, and felt. From wearable accessories such as hats, mittens, scarves, socks, and wraps to home decor including a tea cozy, pin cushion, needle case, and laptop cover, these 30+ pieces are sweet, lively and add a little joy to every household. Each project features creative embellishments and personal touches, including beading, buttons, needlefelting, appliqué, and embroidery. Mags also shares her recipes for easy food gifts and simple sewing projects such as sewn fabric gift bags and sachets to pair with fiber gifts. Directions for making these little add-ons that make a gift personal and extra-special are scattered throughout the book. 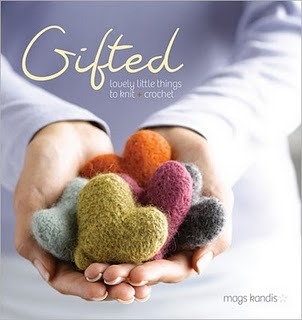 Gifted will inspire you to grab another ball of yarn and invest a little time and love to create something special for someone special.liant new techniques to add to your repetoire, including lace patterns, tulip eyelets, and cable and pointelle chevrons.